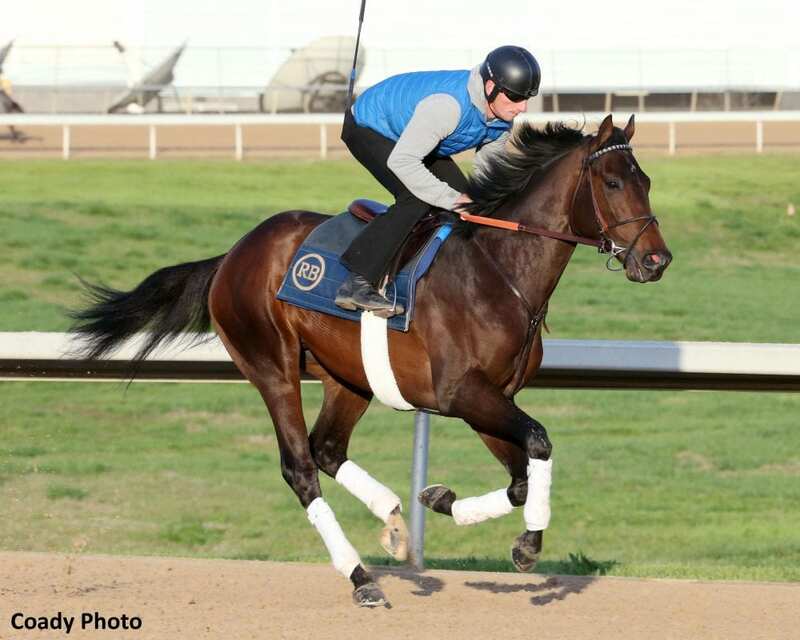 Grade II winner Quip is set for his 4-year-old debut in the Grade III $150,000 Mineshaft Handicap on Saturday, February 16, where he will break from the outside in the 13-horse field. Owned by WinStar Farm, China Horse Club and SF Racing, the son of Distorted Humor has not raced since finishing a well beaten eighth in the Grade I Preakness Stakes last May behind eventual Triple Crown winner Justify. Quip has won three of his six career starts which include a triumph in last year's Grade II Tampa Bay Derby over fellow Mineshaft Handicap competitor Flameaway (post nine, Tyler Gaffalione, 5-1). Although, he has yet to race at Fair Grounds, Quip trained at the New Orleans oval last winter for trainer Rodolphe Brisset. Quip will be ridden by Luis Saez and is the 5-1 morning line third-choice. G M B Racing's Lone Sailor is the 7-2 morning line favorite for the Mineshaft Handicap. Trained by Tom Amoss, the son of Majestic Warrior last raced in the Grade I Breeders' Cup Classic at Churchill Downs in November, where he was sixth beaten 5½ lengths. His prior start was his only graded stakes win, which took place in the Grade II Oklahoma Derby at Remington Park. Lone Sailor has raced three times over the Fair Grounds main track including a close second behind Noble Indy in last year's Grade II Louisiana Derby Presented by Twinspires.com. He will be ridden by James Graham. Front Row Racing, Ten Strike Racing, Kevin McReynolds and Bob Miller's Harlan Punch will look to add a second stakes victory this meet when he breaks from the two hole under Florent Geroux at 4-1 odds. The Brad Cox trained son of Harlan's Holiday was a three-quarter length winner of the Louisiana Stakes on January 19 last time out over Silver Dust (post four, Jack Gilligan, 6-1) and Phat Man (post eight, Adam Beschizza, 8-1). He will attempt the second graded stakes victory of his career. Last June, he won the Grade III Phillip H. Iselin Stakes at Monmouth Park. Imperative (post one, 30-1, Joe Bravo), Krewe Chief (post three, Manny Franco, 15-1), Third Day (post six, Jose Ortiz, 20-1), Long On Luck (post 10, Gabriel Saez, 20-1), Ballard High (post 11, Corey Lanerie, 30-1), Thirstforlife (post 12, Miguel Mena, 15-1) round out the field. The Mineshaft Handicap is named in honor of William S. Farish's 2003 Horse of the Year whose stellar campaign included wins in the Jockey Club Gold Cup, Woodward Stakes, Suburban Handicap and Pimlico Special (all Grade I races). Trained by Neil Howard, Mineshaft also won three times at Fair Grounds including in the Grade II New Orleans Handicap. Carded as the ninth race on Louisiana Derby Preview Day Presented by Lamarque Ford, the Mineshaft Handicap has a 4:25 p.m. CT scheduled post. Earlier on the card, Michael Hui's 10-year-old war horse Hogy will go for his tenth triumph at stakes caliber in the $75,000 Colonel Power Stakes. The seasoned son of Offlee Wild won the 2017 edition of the Colonel Power and will be making his 55th career start in Saturday's race. Three of his stakes wins were won at graded stakes level including his last trip to the winner's circle in Gulfstream Park's Grade III Canadian Turf Stakes. The only horse in the field with earnings at the seven-figure mark, Hogy has banked a total of $1,338,282 in lifetime earnings. Jockey Jose Ortiz will be aboard Hogy who breaks from post seven as the 5-2 morning line favorite. He is trained by Mike Maker. Kid Perfect (post one, Adam Beschizza, 8-1), Leadem In Ken (post two, Danny Sorenson, 6-1), Adonis Creed (post three, Florent Geroux, 3-1), Chaos Theory (post four, Tyler Gaffalione, 15-1), Wings Locked Up (post five, James Graham, 6-1), Latent Revenge (post six, Gabriel Saez, 9-2), Savage Battle (post eight, Joe Bravo, 10-1) complete the field. The Colonel Power is the second race on the card and has a scheduled post time of 12:58 p.m. CT. This entry was posted in Racing and tagged distorted humor, fair grounds, flameaway, imperative, lone sailor, Luis Saez, majestic warrior, Mineshaft, Mineshaft Handicap, Preakness Stakes, quip, rodolphe brisset, Tom Amoss by Press Release. Bookmark the permalink.